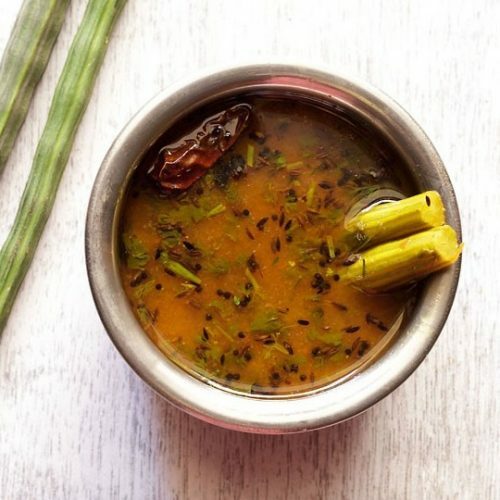 drumstick rasam recipe - a tangy version of rasam made with drumsticks. add the tomato puree, drumsticks, turmeric powder, red chili powder, 2 cups water in a pot or pan. bring to a boil and simmer till the drumsticks are cooked, uncovered. squeeze the tamarind pulp straight into the bowl of water. add the tamarind pulp, rasam powder, jaggery and salt. stir well. simmer for 5-6 minutes more or till the raw aroma of the tamarind goes away. in a small pan, heat oil. add the mustard and urad dal first. let the mustard seeds pop first and at the same time the urad dal would also start getting browned. now add the cumin and fry for a few seconds. add the dry red chilies, curry leaves, asafoetida and fry for some seconds. pour the tempering mixture in the the rasam. stir and mix in the coriander leaves. serve the drumstick rasam hot with rice or as an accompaniment with sambar.